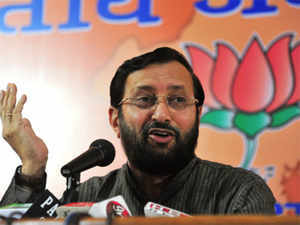 Javadekar added that the Congress party is trying to malign the image of the democratic institutions of the country. The Supreme Court today has sought explanation from Rahul Gandhi on his allegedly contemptuous remark that the apex court had made adverse remarks on the Prime Minister in Rafale case. NEW DELHI: Reacting to Supreme Court's decision to seek an explanation from Rahul Gandhi on a contempt plea filed against him, the Bharatiya Janata party (BJP) today accused Gandhi scion of peddling lies and trying to malign the clean image of Prime Minister Modi. Union Human resource development minister, Prakash Javadekar addressing the media at the BJP office in New Delhi said, "Rahul said that the Supreme Court has accepted the charges of corruption in the Rafale deal, he said that the Prime Minister stole Rs 30,000 crore and and gave that money to (Anil) Ambani. Contrary to that SC made it clear today that it has said nothing on these line. Which makes it clear that all that Rahul does is lie day in and day out." "Congress is all about jhoot (lie ) and loot (steal )", Javadekar added. "They lie to the nation, that is all they do and then they steal from the country. Their (Congress) tenure was full of corruption, they did not spare any sector while stealing from the country." The BJP has also asked the Congress chief to apologise to the nation for "peddling lies". The Supreme Court today has sought explanation from Rahul Gandhi on his allegedly contemptuous remark that the apex court had made adverse remarks on the Prime Minister in Rafale case. The BJP had approached the court against the Congress president's reported remark that even the "Supreme Court agrees that chowkidar is a chor". The SC said it never dealt with the issue, but was only dealing with admissibility of documents in the Rafale case. We make it clear views attributed to this court by Rahul Gandhi in media/public on Rafale verdict have been incorrectly attributed, the judges said. Earlier, while talking to the media after SC made the allegedly 'stolen' Rafale documents admissible in court, Rahul had said "The Supreme Court has made it clear that "chowkidar" allowed "theft and that it had accepted that some sort of corruption had taken place in the Rafale deal".